Aquamarine and bloodstone, March’s two birthstones, are very different when it comes to appearance, but they share a similar reputation for protecting one’s well-being. 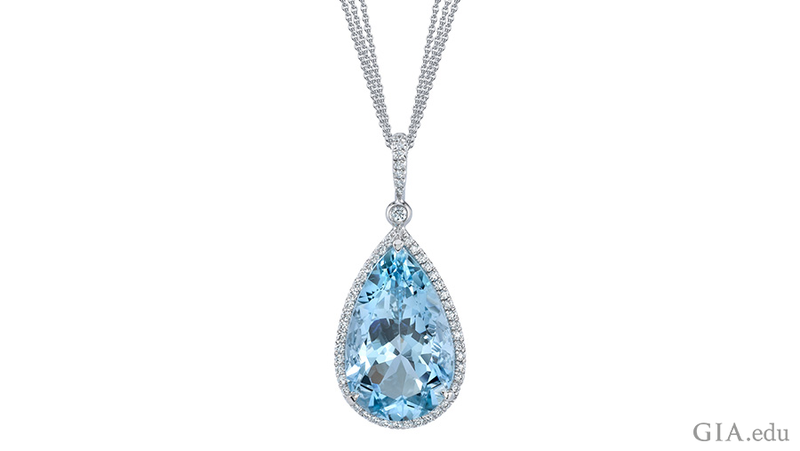 The aquamarine birthstone evokes the colours of the sea. From deep green-blue to light, slightly greenish blue hues, faceted aquamarines are often free from inclusions and as clear as water, symbolising purity of spirit and soul. The bloodstone birthstone is typically a dark-green cabochon that contains red spots of iron oxide, the “blood” that brings health and strength to the wearer. Read on to learn more about these two March birthstones – what they mean and where they can be found. Aquamarine’s name comes from the Latin for seawater, and ancient mariners claimed the gem would calm waves and keep sailors safe at sea. This March birthstone was also thought to bring happiness in marriage. Beryl was believed to give the wearer protection against foes in battle and litigation. It was also thought to make the wearer unconquerable and amiable, and to quicken the intellect. Aquamarine is not only the birthstone for March, but the gem is also given as a present on the 19th wedding anniversary. 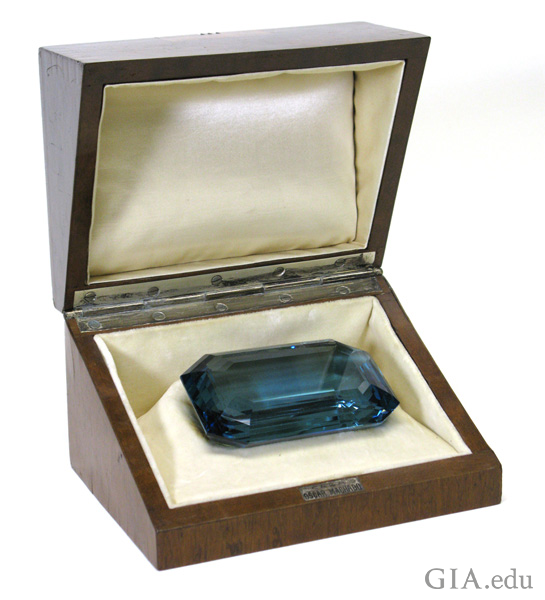 As for famous ones, in 1936 the government of Brazil gave First Lady Eleanor Roosevelt a dark blue rectangular step-cut aquamarine that weighed 1,298 carats (ct). It was the larger of two stones faceted from a piece of aquamarine rough that itself weighed an impressive 2.9 pounds (1.3 kilograms). It is now housed at the Franklin D. Roosevelt Presidential Library and Museum in Hyde Park, New York. A celebrated attraction at the Smithsonian Institution is the 10,363 ct (about 4.6 pounds) Dom Pedro Aquamarine – believed to be the largest faceted aquamarine in the world. The approximately 14 inch (36 centimetre) high obelisk was fashioned by acclaimed German lapidary Berndt Munsteiner using the fantasy cut technique. The Brazilian state of Minas Gerais has been an important source of aquamarine for the past two centuries. Travel there and you’ll find a changing panorama of landscapes: rocky hills, rivers and scrub brush dominate the central and eastern regions; savannahs, forests and streams chequer the west; and lush green hills roll southward. Aquamarines are found in primary (hard rock) and secondary (weathered) pegmatite deposits in the eastern portion of the state, near the gem centre of Teófilo Otoni. Aquamarine is also found high in the Karakorum foothills of Pakistan. 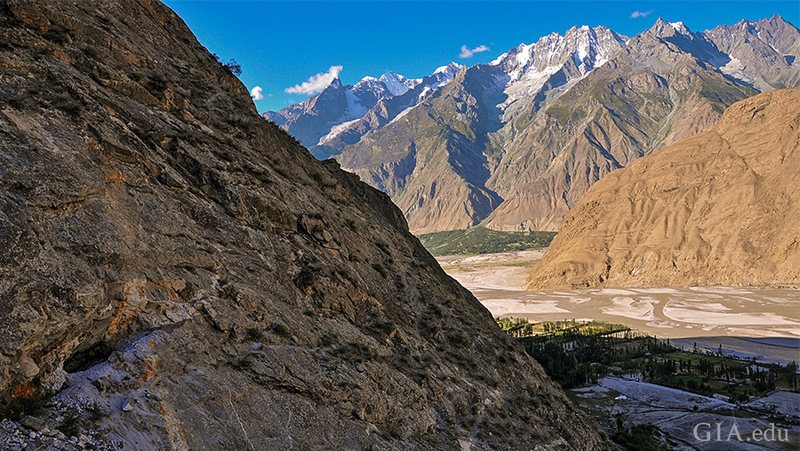 To reach the deposits, miners must climb steep paths to elevations of 9,800 to 13,000+ feet (3,000 to more than 4,000 metres) and work the sides of forbidding cliffs. Below this inhospitable rocky world lie fertile valleys, rushing rivers and small towns. Aquamarine from this area has been described as “water clear”. Aquamarine birthstones are also mined in Kenya, Madagascar, Nigeria, Zambia and Mozambique, as well as elsewhere in Africa. U.S. sources include the Mount Antero area of Colorado (it’s the state gem) and California’s Riverside and San Diego counties. In addition, aquamarine has been found in China, Myanmar, Russia and Ukraine, among other countries. With a hardness of 7.5–8 on the Mohs scale, this March birthstone is durable enough for everyday wear. Caring for the gem is easy. Use warm water, mild dish soap and a toothbrush to scrub behind the birthstone where dirt can collect. Ultrasonic cleaners and steam cleaning are usually safe options as long as there are no fractures or liquid inclusions in the gem. Bloodstone, also known as heliotrope, is a variety of chalcedony (cryptocrystalline quartz) that is traditionally semi-translucent to opaque dark green jasper with red inclusions of iron oxides, especially haematite. Bloodstone’s alternate name heliotrope comes from the ancient Greek word that means “to turn the sun”. In ancient times, these March birthstones were believed to turn the sun red if they were placed in water. The name bloodstone derives from the belief by some that the colour pattern has religious significance, representing the blood of Christ. Several metaphysical properties have been attributed to this March birthstone. They include increasing strength, giving invisibility, and preserving health and youth. In modern times, many believe the bloodstone birthstone to be a lucky charm, as it is prized by athletes and others who want to grow their strength. Even today in India, fine bloodstones may be crushed into a powder and used as an aphrodisiac. Although bloodstone does not share the same beauty as the aquamarine March birthstone, many prize bloodstone for its special properties. Bloodstones used as gems are typically cut as cabochons, though some striking examples are faceted. Most bloodstone in the marketplace today is from India. However, the birthstone also comes from parts of Brazil, Australia, China and the United States, among other countries. Bloodstone can be found filling fractures or cavities in other rocks or as pebbles in riverbeds. Slab of bloodstone from Asia. Your bloodstone birthstone can be easily cleaned at home with warm soapy water and a soft brush. It is important to keep your bloodstone away from harsh chemicals and extremely hot temperatures. Dry off this March birthstone with a clean, soft cloth. To keep the stone from getting scratched (it’s 6.5–7 on the Mohs scale), it is important to store your bloodstone birthstone in a soft fabric. Born in March? Pisces and Aries are your zodiac signs. Jewellery designers have fashioned some creative pieces, and we’ve found some for you to enjoy. The March birthstones aquamarine and bloodstone have it all: they are beautiful, rich in lore and exceptionally wearable. Now you know how to pick one that will become a cherished addition to your jewellery wardrobe.